Technology companies require translation services provided by professionals who have a deep understanding of not just other languages, but also the cultural intricacies of their target markets. They need translation partners who are team players and trained to coordinate and problem-solve alongside their programmers and technical experts at each stage of the product development process. 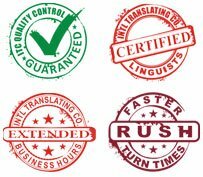 More than anything, they need translation professionals talented enough to create content for their clients indistinguishable from content written by a native speaker.